With just over eight weeks to go until Cheltenham Fashion Week (17-21 September), Cheltenham-based Silver Ball PR has unveiled an enormous pink stiletto, which will ‘tour’ the Gloucestershire Cotswolds in a bid to raise interest in the event. The fuchsia-pink shoe – which measures in at 10 feet tall and 12 feet long – big enough to fit four people inside – started its tour at the Art Couture event in Painswick. From there, it has already travelled to the Cheltenham Lido, Cheltenham Racecourse and Cleeve Hill. Cheltenham Fashion Week is offering members of the public the chance to win four tickets to Boutique 24 – Cheltenham Fashion Week’s designer shopping day at Cowley Manor – by tweeting pictures of The Giant Shoe to @CheltFashionWk. The hashtag is #giantshoe. After exploring many avenues including phone calls to Selfridges we came across our heel, a giant shoe with a very fashionable heritage. First commissioned by New Look head office, the shoe appeared in the window of its flagship store on London’s Oxford Street. 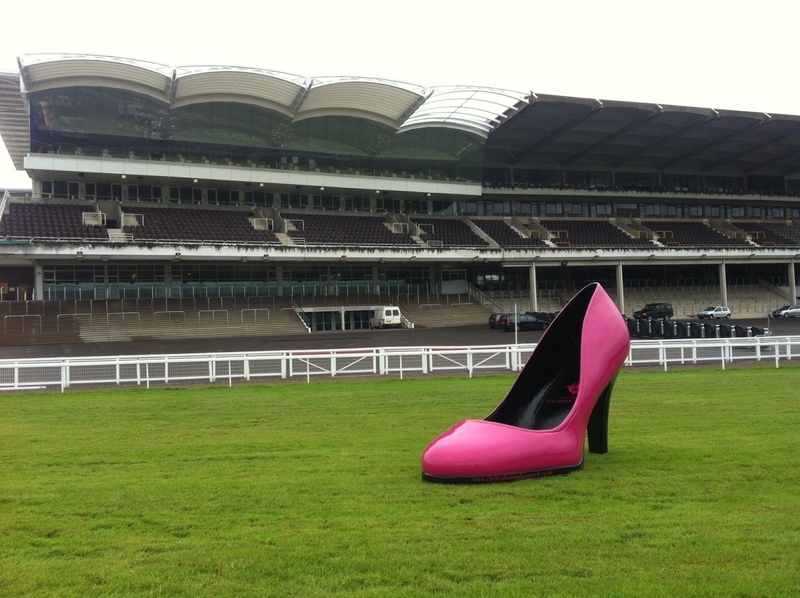 Leaving there, the shoe headed up North to Doncaster Racecourse where it was used among other things as a bar and featured at Ladies Day. After seeing many a merry tipple and a hat or two the shoe was then bought through eBay by Kay Bennett in the hope of selling it on to fund a Play Gym for her child minding business. On seeing the shoe advertised in the Spenborough Guardian, Cheltenham Fashion Week quickly snapped it up. Although we were not without competition, the shoe also caught the eye of reality TV star and former glamour model Katie Price! The tour will be documented here, as it happens.